Paul Morgan Architects’ Monash University, Building 40 Workshops, Clayton is more than a ‘trade shed’, bringing workshops of the Faculty of Science and Facilities and Services Division together in a significant refurbishment and extension interpreting the historic campus. More than just a ‘trade shed’, Building 40 Workshops plays a critical part in the sequence of North West Precinct projects under the new Monash University Masterplan. 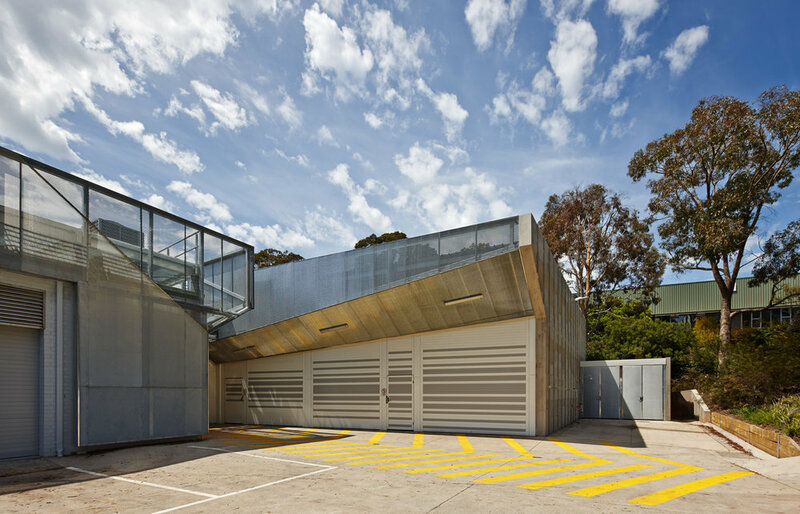 This project brings the workshops of Monash University’s Faculty of Science and its Facilities and Services Division together under the same roof. In what was essentially the refurbishment and extension of an existing building in an unloved part of the university’s Clayton campus, Paul Morgan Architects set out not only to rationalise workshops from across the campus, but to dignify this crucial building. Designed and built in the late 1950s, the Clayton campus is a modernist re-interpretation of historical university campus design. Appropriately, the major landmark on campus is also a work of high modernism, the Sir Robert Menzies Building, built in the early 1960s in the now-familiar mould of the commercial office tower type. The new Building 40 Workshops sit in a precast shell that mimics the patterns of the iconic Menzies Building’s facade, its spandrel panels and blinds frozen in time and cast in concrete at two-thirds the scale. Rather than appearing as the usual ‘trade shed’, then, Building 40 Workshops carries the ‘memory’ of this International Style university façade – appropriate, given the new building plays a critical part in the sequence of North West Precinct projects under the new Monash Masterplan for the Clayton Campus. Tania Davidge, ‘Building 40 Workshop Monash University’, Architectural Review Asia Pacific (August/September 2014).